Jeep enthusiasts rejoice: The brand's 70th Anniversary has inspired an exhibit at the Walter P. Chrysler Museum. The exhibit 70 Years of Jeep celebrates the beloved brand and its evolution from military vehicle to one of the auto industry's brand-darlings. 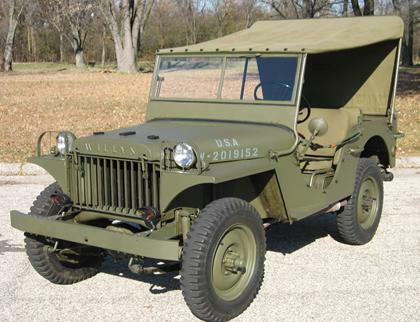 Starting April 19th and running through December, the Chrysler museum in Auburn Hills, Michigan will be home to the exhibit that will feature a classic, yet rare Jeep model: Willys MA78621. Just how rare you ask? The car is one of only 45 known models stemming from the benchmark year of 1941. Jeep fans will cringe at the thought that this particular model was found rotting in a field near Fort Lewis. It was restored in 2002 and was believed to be one of 4 MA's shipped to Fort Lewis for testing by the 15th Infantry. Jeep's passionate brand loyalists will relish viewing the iconic progress of Jeep with the exhibit's sizable collection of models ranging from the 1940-era classics to the innovative auto-concepts of the mid 2000's. It is fantastic that your CJ5 is able to continue its legacy at the museum. I'm sorry to hear that your Jeep did not receive proper recognition from the museum. You should let us know if the CJ5 made it into the show and feel free to send us pictures from your visit. We would love to make a blog post about it! Bob, You can send pictures to ahartig@bettenimports.com. I would love to be able to use the pictures on our blog, giving you the proper recognition, of course! I'm excited to see your photos! I hope you have a good time at the museum! Is it possible that I could email you a few simple questions about your Jeep so I can have some more information for my blog post? Let me know if you would feel comfortable with that, if not, I understand and we will still use your pictures. Thanks. Have fun at the museum Bob. I can't wait to see your pictures and hear how it all went!